B.A., with Highest Distinction, University of Kansas, 1988. 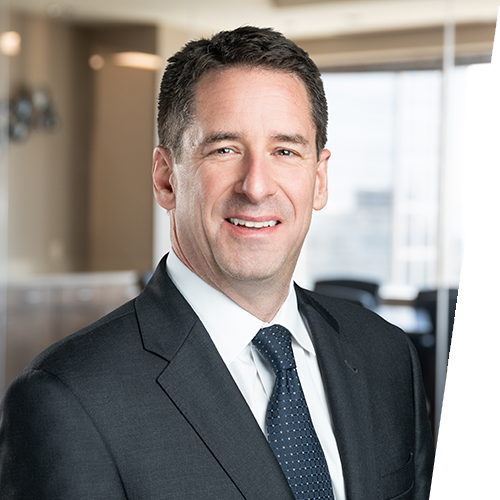 Craig’s diverse professional experience comprises a wide variety of civil litigation matters, ranging from railroad defense, complex commercial litigation, products liability, industrial accidents, employment law, and legal malpractice. Craig has tried multiple cases to verdict in Kansas and Missouri courts. Craig’s appellate experience enables him to continue representing his clients after judgment, and he has successfully handled appeals before the United States Courts of Appeals for the Seventh, Eighth and Tenth Circuits, the Missouri Supreme Court and Court of Appeals, and the Kansas Supreme Court and Court of Appeals. Craig has accumulated an extensive working knowledge of the railroad industry through his defense of railroad clients in actions arising from workplace injuries and railroad crossing accidents, often involving the immediate on-site investigation of accidents and the coordination of experts in such disciplines as train handling and dynamics; biomechanics; traffic engineering; accident reconstruction; audiology; and medicine. Successfully defended railroad in wrongful death action arising from a multiple-fatality accident occurring at a railroad grade crossing, resulting in a unanimous defense verdict following a two-week jury trial. Obtained defense verdict in FELA claim brought by machinist alleging permanent back injuries from workplace injury. Achieved defense verdict in FELA claim brought by a locomotive mechanic claiming acute injuries from a workplace incident, then successfully defended the verdict on appeal to the Missouri Supreme Court. Lozano v. BNSF Ry. Co., 421 S.W.3d 448 (Mo. 2014). Received a split verdict in FELA case, where the jury found in the railroad’s favor on a negligence claim and awarded only $7,500 to plaintiff on a Safety Appliance Act claim where the plaintiff sought more than $700,000 in damages, then successfully defended the verdict on appeal to the Missouri Court of Appeals. Shearer v. Union Pac. R.R. Co., 471 S.W.3d 397 (Mo. Ct. App. 2015). Obtained a defense verdict in FELA action in which the plaintiff sought damages for a gunshot injury suffered on the job, then successfully defended the verdict on appeal to the Missouri Supreme Court. Cluck v. Union Pac. R. Co., 367 S.W.3d 25 (Mo. 2012). Participated in the successful defense of a railroad in a three-week jury trial alleging breach of a coal transportation contract, where the plaintiff sought more than $100 million in damages. Achieved summary judgment for passenger railroad and freight railroad in personal injury claims asserted by more than 30 passengers following a train derailment. Court’s opinion granted summary judgment for the railroad on all negligence claims and granted all five of railroads’ Daubert challenges to the passengers’ retained liability experts. Successfully appealed adverse verdict in FELA action, prompting the Kansas Supreme Court to characterize post-accident discipline as an inadmissible subsequent remedial measure. Bullock v. BNSF Ry. Co., 306 Kan. 916, 399 P.3d 148 (2017). Obtained summary judgment for a railroad defending a $25 Million claim alleging breach of a coal transportation agreement, then successfully defended the appeal to the United States Court of Appeals for the Seventh Circuit. Wisconsin Elec. Power Co. v. Union Pac. R. Co., 557 F.3d 504 (7th Cir. 2009). Obtained summary judgment in legal malpractice action, where unsecured creditors alleged that the attorney for a debtor in possession in Chapter 11 bankruptcy proceeding breached duties owed to the creditors. Successfully defended the appeal to the United States Court of Appeals for the Tenth Circuit. Simmons Foods, Inc. v. Willis, 74 F. App’x 15, 17 (10th Cir. 2003). Won summary judgment for short line railroad in wrongful death action brought by employee of contractor who was crushed between railroad car and front loader. Obtained summary judgment in two FELA cases alleging cumulative trauma injuries to railroad employees, then successfully defended the judgments on appeal to the Kansas Court of Appeals, resulting in the first Kanas appellate decisions interpreting Kansas’s recent adoption of Daubert standard for admissibility of expert testimony. Smart v. BNSF Ry. Co., 52 Kan. App. 2d 486, 369 P.3d 966 (2016) and Farley v. BNSF Ry. Co., 367 P.3d 1284 (Kan. Ct. App. 2016). Obtained summary judgment for trailer manufacturer in products liability action in which the plaintiff sought damages for paraplegia, then successfully defended the appeal to the United States Court of Appeals for the Eighth Circuit. Briant v. Timpte, Inc., 9 F. App’x 561 (8th Cir. 2001). Achieved summary judgment for railroad in subrogation action brought by insurer of shipper that sought damages to freight and rolling stock after train load of soda ash was inundated by unprecedented flooding. Successfully defended railroad in wrongful termination action brought under the Family Medical Leave Act, resulting in summary judgment for railroad on all claims. Obtained summary judgment for pharmaceutical manufacturer in wrongful death action alleging defects in sleep medication, then prepared successful brief to the United States Court of Appeals for the Sixth Circuit. Obtained summary judgment for manufacturer of contact lens manufacturer based on federal preemption under the Medical Device Amendments to the Food, Drug and Cosmetic Act.